Pinzani, Alessandro and Rego, Walquiria Leão 2019. Money, Autonomy and Citizenship. p. 11. Mauro, Vincenzo Biggeri, Mario and Maggino, Filomena 2018. Measuring and Monitoring Poverty and Well-Being: A New Approach for the Synthesis of Multidimensionality. Social Indicators Research, Vol. 135, Issue. 1, p. 75. Hart, Caroline Sarojini and Brando, Nicolás 2018. A capability approach to children's well-being, agency and participatory rights in education. European Journal of Education, Vol. 53, Issue. 3, p. 293. Hobson, Barbara 2018. Gendered Dimensions and Capabilities: Opportunities, Dilemmas and Challenges. Critical Sociology, Vol. 44, Issue. 6, p. 883. Castro, Vítor and Martins, Rodrigo 2018. The Electoral Dynamics of Human Development. The Journal of Development Studies, Vol. 54, Issue. 1, p. 191. Agnello, Luca Castro, Vitor Jalles, João Tovar and Sousa, Ricardo M. 2018. The Impact of Fiscal Consolidation on Human Development. Journal of International Development, Vol. 30, Issue. 3, p. 399. Meeks, Gay 2018. New Frontiers of the Capability Approach. p. 12. Biggeri, Mario and Mauro, Vincenzo 2018. New Frontiers of the Capability Approach. p. 314. Michel, Sandrine and Randriamanampisoa, Holimalala 2018. The capability approach as a framework for assessing the role of microcredit in resource conversion: the case of rural households in the Madagascar highlands. Oxford Development Studies, Vol. 46, Issue. 2, p. 215. Kato, Shoko Ashley, Shena R. and Weaver, Rasheda L. 2018. Insights for Measuring Social Value: Classification of Measures Related to the Capabilities Approach. VOLUNTAS: International Journal of Voluntary and Nonprofit Organizations, Vol. 29, Issue. 3, p. 558. Loh, Yvonne Ai-Chi and Chib, Arul 2018. Tackling social inequality in development: beyond access to appropriation of ICTs for employability. Information Technology for Development, p. 1. Comim, Flavio 2018. New Frontiers of the Capability Approach. p. 179. Wangel, Arne 2018. Back to basics—the school lunch. The International Journal of Life Cycle Assessment, Vol. 23, Issue. 3, p. 683. Krishnakumar, Jaya and Nogales, Ricardo 2018. New Frontiers of the Capability Approach. p. 246. Ling, Liong Ing Wilson, Jill and Shevellar, Lynda 2017. Microfinance for Entrepreneurial Development. p. 107. Baujard, Antoinette and Gilardone, Muriel 2017. Sen is not a capability theorist. Journal of Economic Methodology, Vol. 24, Issue. 1, p. 1. Gloss, Alexander Carr, Stuart C. Reichman, Walter Abdul-Nasiru, Inusah and Oestereich, W. Trevor 2017. From Handmaidens to POSH Humanitarians: The Case for Making Human Capabilities the Business of I-O Psychology. Industrial and Organizational Psychology, Vol. 10, Issue. 03, p. 329. Hannon, Cliona Faas, Daniel and O'Sullivan, Katriona 2017. Widening the educational capabilities of socio-economically disadvantaged students through a model of social and cultural capital development. British Educational Research Journal, Vol. 43, Issue. 6, p. 1225. The capability approach developed by Nobel Laureate Amartya Sen has become an important new paradigm in thinking about development. However, despite its theoretical and philosophical attractiveness, it has been less easy to measure or to translate into policy. This volume addresses these issues in the context of poverty and justice. Part I offers a set of conceptual essays that debate the strength of the often misunderstood individual focus of the capability approach. Part II investigates the techniques by which we can measure and compare capabilities, and how we can integrate them into poverty comparisons and policy advice. Finally, Part III looks at how we can apply the capability approach to different regions and contexts. 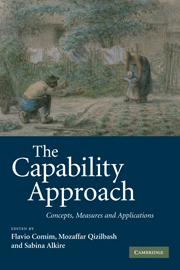 Written by a team of international scholars, The Capability Approach is a valuable resource for researchers and graduate students concerned with the debate over the value of the capability approach and its potential applications. 2 - Amartya Sen's capability view: insightful sketch or distorted picture? 9 - Complexity and vagueness in the capability approach: strengths or weaknesses? 14 - Capabilities over the lifecourse: at what age does poverty damage most? 17 - Women and poverty in Mozambique: is there a gender bias in capabilities, employment conditions and living standards?